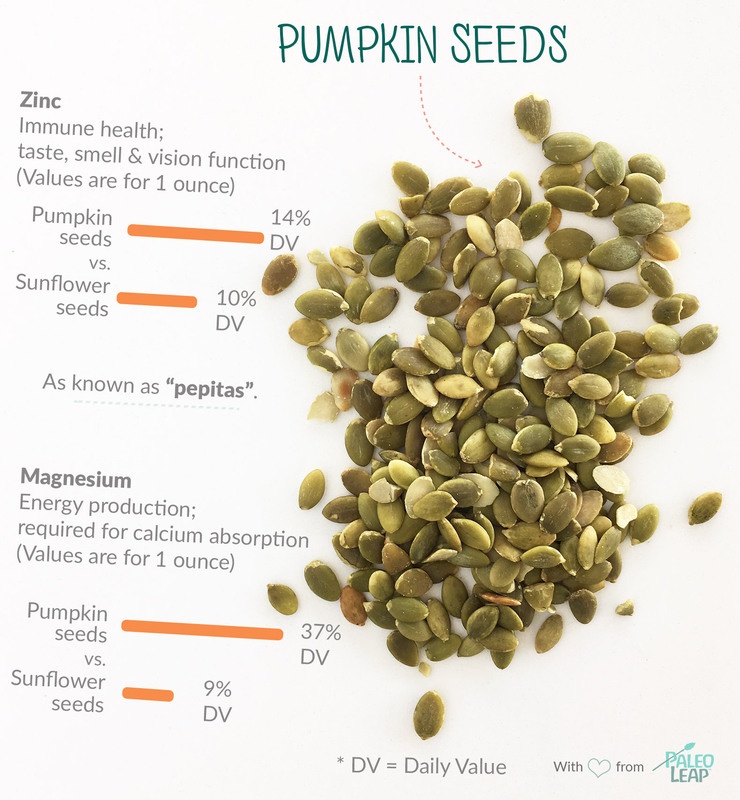 Pumpkin seeds may be small, but they are packed with nutrients and quality fats! Pumpkin seeds — also called pepitas — are flat, oval and green in color. The term “pepita” is derived from Mexico and means “little seed of squash”. Pumpkin seeds are notably plucked from pumpkins as a Halloween tradition, then roasted for a nutrient-rich and delicious snack. Because these seeds contain fragile omega-6 fats, if you choose to roast them, it’s best to roast them quickly — under 20 minutes — then store in an airtight container in a cool, dark location. These seeds are packed with nutrients like magnesium, zinc, manganese and phosphorous. Orange dots show how 1 ounce of pumpkin seeds fit into the typical nutrient profile of a Paleo meal. Purchase raw (and preferably organic) pumpkin seeds in prepackaged containers or bulk bins. A benefit to buying raw pumpkin seeds is the ability to control the roasting temperature. GREEN OR WHITE: Some pumpkin seeds are encased in a hard white shell, however most stores sell the shelled, green variety. RAW OR ROASTED: Pumpkin seeds can be eaten either raw or roasted. Roasting brings out a nutty, rich flavor with a bit of crunch. Chop and sprinkle over soup to add crunch. Add pumpkin seeds to a smoothie. Toss whole or finely chopped pumpkin seeds on top of sautéed vegetables or a salad. Grind pumpkin seeds and mix with olive oil, lemon and herbs to make a salad dressing.